"Blood Is Thicker Than Water Part 1"
"Blood Is Thicker Than Water Part 2"
"Take Some Getting Used To"
"I Can't Lie To You"
Head over to the Wicked Little Dragons website HERE to check out all the song lyrics. 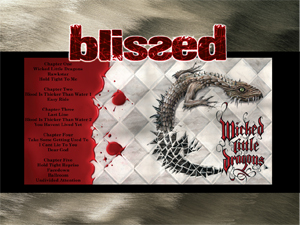 BLISSED was formed in 2002 by vocalist David Pearson and included STRYPER drummer Robert Sweet. The band released a very limited edition, 4 song EP entitled IIII before releasing the band's first full length album, Waking Up The Dead in 2003. Robert Sweet returned to STRYPER after their 1990's hiatus and BLISSED continued on with a new lineup, releasing 2 more albums, 2006's Corrosive, which garnered the band a Canadian Grammy nomination for the song "Superhero" and for Hard Rock Album Of The Year, and Death Is Not The End in 2010 that propelled the band into the festival circuit and full time touring. Currently comprised of David Pearson (vocals/guitars), Sammy James (bass/vocals), guitarists Russell Raven and Jake Taylor, and Matt Kenedy (drums), the band is continuously recording new music, having recently recorded some cover tunes such as LED ZEPPELIN's "Immigrant Song" and THE BEATLES' classic track, "Eleanor Rigby", the performance video for which you can watch on KNAC.COM right HERE.